No Strips …… No hassles ……. No pain ……..
• Whitens in less than 30 minutes a day …..
• Lapiss HP is an advanced whitening pen developed by dentists to achieve a long lasting white smile with virtually “zero” sensitivity in the comfort of the patient’s own home. It offers your patients an affordable and convenient teeth whitening. • Lapiss HP whitening pen is ideal for touch-ups on patients that had their teeth whitened before. It will recharge the whiteness. It is also great as whitener on-the-go. Patient can apply the gel in the comfort of their home. It can be applied at night or during the day. The special formulation makes the gel adhere to the tooth very quickly and a film forms on the tooth. 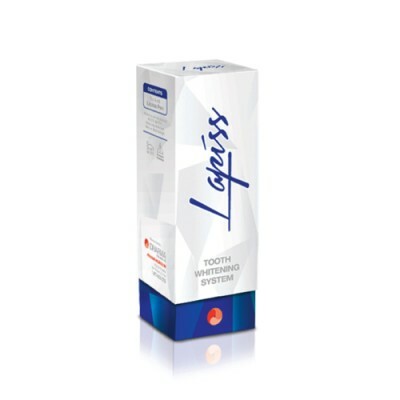 Lapiss HP is an excellent marketing addition for your tooth whitening business. No trays are necessary. Patient does all the work. The Lapiss HP whitening pen is extremely affordable for your patients and can be used to introduce your patients to whitening procedures. The addition of fluoride remineralizes the tooth enamel while minimizing post-operative sensitivity. Product does not require trays or equipment. No chair time required. It is very easy to apply. The soft brush allows for even distribution of the gel over each tooth surface. Patient has the flexibility of targeting a specific tooth. 6. It is recommended that Lapiss HP be applied after brushing and flossing by simply twisting the dial clockwise until the gel is dispensed onto the brush. The lot number and expiration date is placed on each Lapiss box. Lapiss has a two year shelf life when kept below 25 degrees Celsius/77 degrees Farenheit.